On March 21, 2005, and dozens of newspapers in Morocco, writes former Moroccan national team coach, Philippe Troussier and his wife Dominic Matteo, officially embraced Islam and converted to Islam. Secondly the couple say the sentence creed, Troussier later changed his name to Omar, while his wife, Dominic became Aminah. This news is certainly not a surprise. The reason long since Troussier was studying religion spread by the Prophet is. One high-ranking club Riyadi Fathi El-Rabat, Mohammed El Homrani, who is also a close friend of Troussier also pleased with the decision of this Troussier. El Homrani said Troussier called him and said, "I have to say shahada with my wife." This was confirmed by two witnesses of the Religious requested Troussier to guide pronounce, sentence twice creed. El Homrani commented that the two words are the correct forms and creeds have same meaning and purpose. With conversion to Islam Troussier and his wife, to El Homrani feel happy for him and the news was not a surprise because El Homrani know for sure that during this Troussier has a duty and a desire to learn the basic teachings of Islam. "I was the one who taught her pronunciation of the two sentences creed so that he memorized in his head while he was still not fluent in the pronunciation," said Homrani. El Homrani said that the name change to receive calls from Omar Troussier and Dominic to Aminah very unpopular both muallaf it. Now, Omar Troussier live in Souissi district, a district inhabited by rich people at the Rabat-Morocco. The White Support (Troussier nickname) is also adopted two orphans Moroccan citizen and he started doing his duty as a Muslim. Troussier contract with La Fédération Royale Marocaine de Football-FRMF (Football Federation of Morocco) null and void, after the federation was short of money. 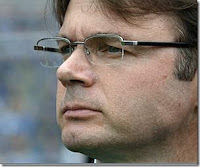 Philippe Troussier guided Japan had become the Asian champions in 2000 and managed to deliver Japan cruised to the second round of the 2002 World Cup, to Zico, Brazil's former leading player mengantikannya as Japan's national team coach. Troussier has also successfully trained about a decade several national teams including Ivory Coast, Burkina Faso, Nigeria, South Africa and Qatar. Prior to coaching the team Lion Atlas of Morocco, Troussier got a lot of offers, including from China, Algeria and the French state to replace Roger Lemerre. However, he was more interested in working in Morocco, because it has a summer home in Casablanca and in the Ibn Battuta was the one that's Traoussier find the instructions of God.